Gareth was a Confluence AmeriCorps Member in 2014-15. 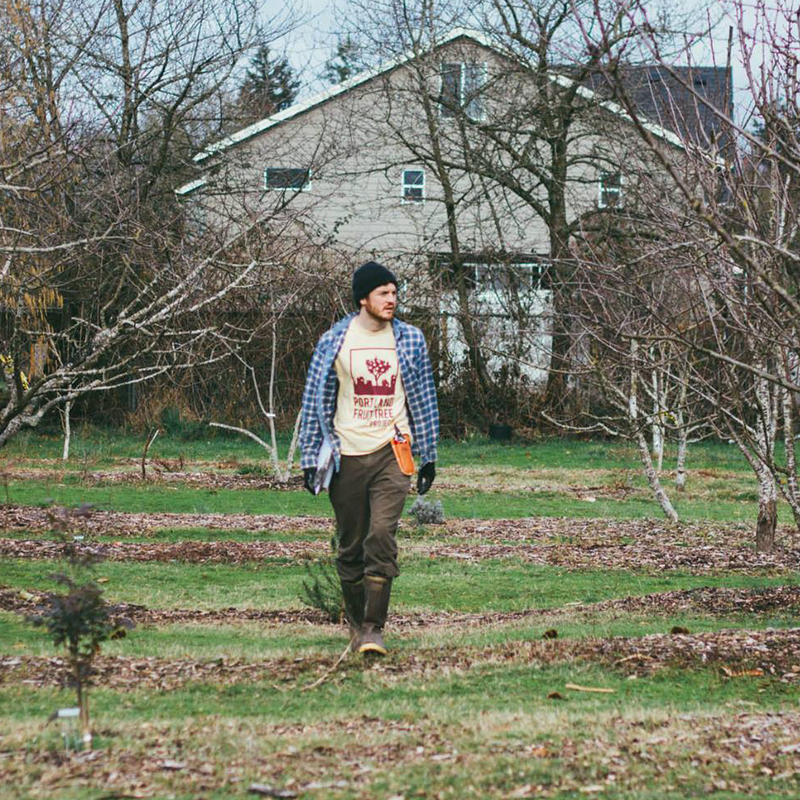 He served at Portland Fruit Tree Project (PFTP) as Community Orchards Coordinator. We sat down with him over coffee and talked about his Confluence experience and where it lead him to today. What did you do as the Community Orchards Coordinator? I managed four community orchards and helped facilitate the creation of a fifth. The orchards created a space for growing fruit for neighborhoods without good access to fresh produce, community building and public education. However, the most important part of my time at PFTP was far and away looking at cool bugs with children. What are you up to now, and how did your time with Confluence prepare you? I am currently employed at Zenger Farm as a Farm Co-Manager. Along with the other co-manager, I run all aspects of organic farm production on 2.3 acres and coordinate our beginning farmer training program. Located in a low-income neighborhood, miles away from the nearest grocery store, we primarily grow for a CSA catered to folks in our zip code, especially those experiencing food insecurity and/or living with chronic, diet related health conditions. I definitely would not have felt prepared for the position without the experience I gained at Confluence and PFTP. While serving with Confluence, I was able to rapidly gain new skills because I suddenly had levels of responsibility I had never had before. Confluence is unique among AmeriCorps agencies in that is prioritizes equity in its trainings. This is essential for training members to collaborate most closely with those most impacted by environmental injustice. I knew how to grow food before spending time at PFTP through Confluence, but I didn't know how to recruit volunteers on a grassroots level, for example. Most importantly, I learned how to effectively prioritize working with folks who face oppression in our food system (ie People of Color, LGBTQ, women, immigrants, and many other communities and populations of people). Confluence doesn't just teach you how to wear many hats on a job, but also helps you decide which hat is going to fit the best. Who should apply for a position with Confluence? I think there is this perception that AmeriCorps is for people coming right out of college who don't necessarily know what they want to do with themselves. I was happy to find that this was not the case with my colleagues at Confluence. Eleven months is a very short time to try to address huge structural issues that create large-scale environmental injustice in our society. I think participants are going to find success serving in an AmeriCorps position if they don't come in with a savior mentality and try to fix everything as an individual. I found that my colleagues who were most serious about listening to the communities they were working with found the most success. Usually, the best listeners are people who come from the community they are collaborating with or at least have working familiarity with said community. In short, people who are solely trying to use Confluence as a "resume" builder won't find nearly as much depth in the program as those who are serious about its mission. How did your perspective on environmental equity work shift after going through confluence? I think more than anything I had a much more tangible grasp on what the work actually looks like in a day to day setting. So much of engaging people is creating ways for equitable participation. If you are hosting an event about air quality in a low income neighborhood, how will you insure that people can actually come? Will there be childcare? Is there food so people don't have to skip dinner? What sort of transportation can they take to your event? After going through Confluence, I now think of environmental equity in an intersectional framework. What is a belief or understanding you had coming into the program and how did it shift? That people don't like healthy food like kale or whatever else. Almost everyone likes fresh produce, especially when they get to grow or harvest it themselves. Do you have any book/movie/podcast recommendations? A really great book about Food Jusice (or injustice rather) is "The Color of Food: Stories of Race, Resilience and Farming" by Natasha Bowens; it details why farmers of color have been left out of the picture in American agrarian systems. Another formative book for me is "Are Prisons Obselete?" by Angela Davis. Or if that is a little radical for your taste, "The New Jim Crow" by Michelle Alexander. I don't watch too many movies about food or the environment, but my favorites are Tangerine, Moonlight, and almost anything by Werner Herzog. What was your favorite tip for living on the AmeriCorps stipend. Most farmer's markets have awesome SNAP Match programs, where if you spend EBT SNAP (i.e. food stamps) tokens, the market will double your purchase for free. There are also even some CSA farms that will give you a scholarship if you are using SNAP! Check out the Portland CSA Coalition to find a farm that does this. Otherwise: check out An Xuyen on SE 52nd and Foster for the best Banh Mi in town; it's like, $3.50. In general Foster-Powell is a great neighborhood to live if you are on a budget. "If you are young and white and moving into a building where everyone else is West Indian, at least introduce yourself to your neighbors. At least ask 'is there a tenant association'? At least go to the local church or work at the food pantry. At least teach somebody how to read or teach a kid to swim. At least buy your coffee from the bodega instead of the five dollar coffee place. I mean there are so many decisions people can make if they are occupying or colonizing a neighborhood or they are coming to be like their neighbors."